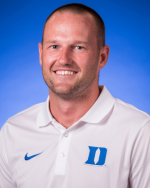 John Kerr enters his 11th season as the head coach of the Duke men’s soccer team. Kerr, inducted into the Duke Sports Hall of Fame in 2004, replaced longtime coach John Rennie, who spent 29 seasons at the helm of the Blue Devil program. Under the guidance of Kerr, the Blue Devils have advanced to five NCAA Tournaments and to the round of 16 in 2009, collected nine NSCAA All-America awards, and a Hermann Trophy winner. Kerr and the Blue Devils come into 2018 looking to add to the fantastic 2017 campaign that saw Duke return to the NCAA Tournament as the No. 6 seed, the first time it had been seeded since 2006. Overall, Duke finished the season with a 13-4-3 overall record and took second in the Coastal Division and fourth overall in the ACC. The six-game improvement from a year ago matched the best one-year turnaround in Duke history, while the 13 wins are the second-most under Kerr.